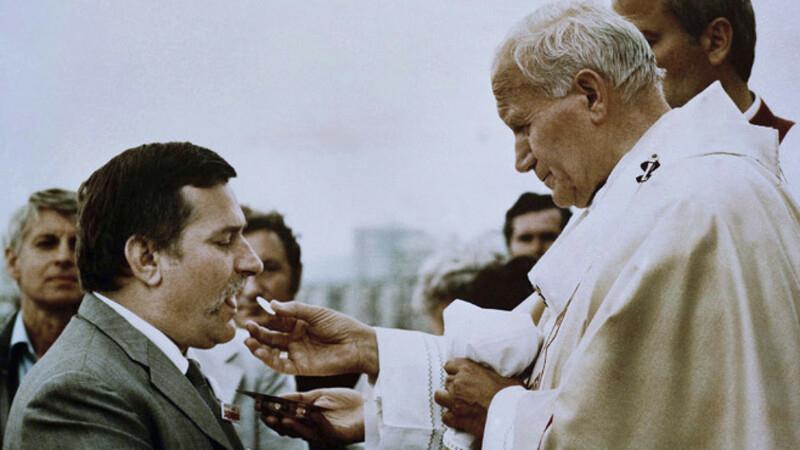 Lech Walesa receiving Holy Communion in 1987 from Pope John Paul II. When communist Poland held its first partly free elections a quarter century ago, Cezary and Alicja Wasowski — expecting their second son — held hopes for modest improvements in their lives but not much more. By the time little Michal was born three months later, it was clear they would be bringing up their son in world vastly different from the one they knew: Poland had just elected its first democratic prime minister in decades and the Soviet system was crumbling before their eyes. Today, Cezary, Alicja and Michal travel freely abroad, read books once banned by censors and express views that reveal surprising generational differences — itself a triumph of democracy. The family spoke to The Associated Press as Poland prepares to celebrate the 25th anniversary of the historic vote on Wednesday, with U.S. President Barack Obama and other world leaders gathering in Warsaw to celebrate the democracy that began at the ballot box in Poland and spread throughout Eastern Europe. "We knew that something was changing but we could not imagine the scale of the changes at first," said Cezary Wasowski, 56. "Then events happened so fast. They were truly revolutionary changes." Like many Poles, he and Alicja have seen their lives improve in many ways. A state that once produced everything "from tanks to condoms," as Cezary put it, has opened up a huge sphere for private entrepreneurship, making his own rise possible as the head of a private engineering firm. His wife no longer spends endless hours in communist-era bread lines. Boundless plenty beckons from shops on every corner. But they do not view all change as progress. They see a new a worship of money that is eroding a traditional focus on family and culture. They do not like how commercial Christmas has become. Their isolation behind the Iron Curtain seemed to deepen friendships and create more time for human interaction, something they miss. "It is hard to say if things are better now," said Alichja. "We were not less happy then." The couple also feels that, in the birthplace of Lech Walesa and his Solidarity movement, too many people have become politically disengaged. They are particularly dismayed that fewer than 24 percent of Polish voters took part in the May 25 elections for the European Parliament. "People complain that the prime minister is bad, the president is bad," Cezary said. "They just complain, but they do not vote." Perhaps ironically, their son — who never knew communism — takes a harsher view than either of his parents of the Soviet era. "I know these were bad times, and I would never want to live in them," he said. The Ukraine crisis has also brought back dark evocations of Moscow's dominance: Since Russia annexed Crimea and moved troops to Ukraine's eastern border, many Poles, including Michal, have wondered whether Poland is out of Russia's grip for good despite its membership in NATO and the European Union. "More than 20 years have gone by and many things have changed," Michal said. "But we still see Russia as a threat." The 1989 vote followed years of economic hardship that sparked nationwide unrest. Strikes in 1980 led to the birth of Solidarity under Lech Walesa's leadership. The regime tried to crush the movement the next year, with leader General. Wojciech Jaruzelski — who died a week ago — imposing martial law, a system of harsh repression. But there was no way to crush Polish yearnings for freedom. In 1988 a new round of strikes broke out that pushed the communist authorities to sit down for the so-called "Round Table" talks with Solidarity. Allowing the dialogue was a new man in the Kremlin, Mikhail Gorbachev, who granted unprecedented freedom to the Soviet satellites as he attempted to reform socialism at home. The Round Table talks resulted in the communist regime legalizing Solidarity and an agreement to hold the June 4 elections. The deal created a new chamber of parliament, the Senate, and opened all of its 100 seats to free voting, while opening one-third of the seats in the more important lower house, the Sejm. The results astounded everyone, even Solidarity activists — whose most ambitious dreams foresaw free elections four years later. Solidarity won 99 of the 100 Senate seats and all contestable 161 seats in the Sejm. The march to full democracy became unstoppable and by the end of the next year Walesa was president. Like many young Poles, Michal was raised with an awareness of his country's tortured history, leaving him to reflect on how his life differs from his parents in their youth. A journalist, he feels that professional life is much more competitive now than during communism, when the state guaranteed each person a job. He has piled work experience onto his studies to gain an advantage. His father sees things slightly differently. Excellence defined the Eastern Bloc programs in engineering and the sciences and he feels his studies were so rigorous that a job on the side would have been impossible. They all agree that the state has become less intrusive, leaving them more freedom and privacy. When Cezary served a year in the military in the 1980s, counterintelligence interrogated him on whether he had any foreign contacts, something the regime viewed with suspicion. After a trip abroad he, like all Poles, would have to return his passport to the authorities. He was forced to submit his master's thesis to the approval of the censors — even though his topic was decidedly apolitical, focusing on engineering aspects of the use of particle board in furniture. These days, the family goes skiing in Austria every winter — and as EU citizens travel passport-free. Cezary and Alicja remember that much of their time under communism was spent just trying to procure foods and other basic goods given the constant shortages. If by chance they got access to something like sugar or vodka, they would buy as much as they could, store it under their bed and use it as barter for other goods they could not find. "I cannot remember a time when you could not get what you need in the shops," Michal chimed in. "I have never experienced not being able to buy something because even if it is not in the shop you just get it online."